If you’ve been watching, you know that Black Lightning has been…well, electrifying this season, with the past two episodes representing a new high-water mark for the show’s ability to shock and surprise. Yet, while the tragedy of Khalil’s death and the emergence of Jennifer Pierce’s Lightning persona will remain in the forefront, we shouldn’t overlook one of season 2’s more intriguing supporting characters—Grace Choi. 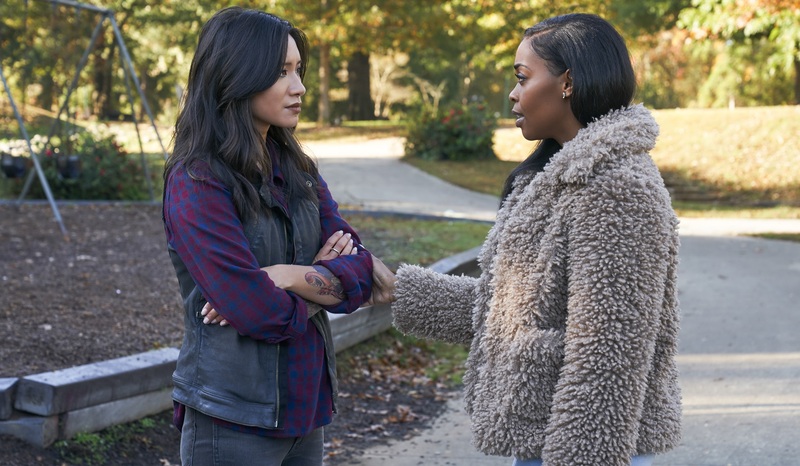 The tattooed bartender-slash-superhero-fan, charmingly played on the series by Chantal Thuy, has reignited her relationship with Anissa and also seems to be developing meta-powers of her own…in a strange and as yet unexplained way. Grace made a brief appearance in last week’s episode, and will play a growing role on the series for the remainder of the season, so it seemed well past time to speak with Thuy about her future on the show. Are Grace and Anissa officially an item? How does it feel to be playing TV’s first Asian-American LGBTQ+ superhero? And what advice would Thuy have for an up-and-coming crimefighter like Thunder? Whether you’re an Outsiders fan, or just a fan of diverse, fascinating new heroes, there’s much to be excited for as Black Lightning finishes its second season. One of the things that’s undeniably fun about Grace Choi on Black Lightning is that she’s a comic book fan. How much did you know about comics and about the character when you were first cast in the role? Prior to being cast, I did not know much about either Black Lightning or Grace. But when I was going through the auditioning process, I read a lot about Black Lightning and his world. That’s when I discovered Grace, and that she was one of the first, or maybe the only bisexual Asian-American superhero. I read about Judd [Winick] and his whole story. What I tell people is that when I first auditioned for it, there were so very few Asian-American superheroes out there, particularly female ones, that I thought I’d never land one. Not in my lifetime! But then I got the job and it was just so amazing and surreal. My comic book experience has included reading things when I was growing up, but it was mainly watching things like Sailor Moon and getting into the Marvel movie universe—all the different franchises. Did you know how important of a character Grace could become for the show? I didn’t know. I had hoped. I was hopeful that the character and her relationship would be developed further, but I wasn’t told one way or another. This season, they’re letting me in on more of what’s happening and what’s in store, so that’s very exciting. How would you describe Grace’s relationship with Anissa at the moment? You see that they had a rough start at the beginning of their relationship this season, which I liked because it’s part of life. I think we’re all humans and we all have different approached to relationships. At this point, we’re dating. We’re together, but we still have our share of secrets. It’s in that phase of the relationship where you’re in love, but you haven’t shared everything. You’re going to probably have to at some point, but when that is remains to be seen. It’s that first six months of a relationship, right? Things are moving forward, but to continue forward you need to keep on being vulnerable and opening up. You get the sense that neither of them are very good at that. To me, Grace has always come off as something of a tough girl, but do you think that’s accurate about her? I think that’s true, and I think that sometimes with people who come across as tough, it’s actually that they’re hiding vulnerability. I think that’s probably true of Anissa, as well, and probably of a lot of people on this show. There’s a certain toughness, but it’s to hide things that they’re not ready to share yet—feelings or secrets. Grace has been experiencing some pretty odd episodes lately. What can you tell us about those? Well, I can reveal that the story will develop and those questions will start getting answered. It obviously has to do with… Well, let’s just say it’s a similar framework as the comic, but made different. Will we be learning more soon, or can we expect answers to be slow and gradual in coming? I think Black Lightning as a show is telling a lot of story, so I have a feeling it’ll be developmental. We know from the comics that Grace ultimately becomes a superhero herself. Are you ready to suit up? I’m excited for what the writers have in store and how they develop the character. I think to be able to one day play a full superhero version of Grace would be super exciting. We have all these young, female fans of the show who are big fans of Grace and the “ThunderGrace” ship. I’m excited to be able to continue to develop the superhero aspect and also the relationship aspect to represent and be a voice for some of those young girls. We touched on this earlier, but sadly, we haven’t seen many Asian-American superheroes onscreen so far—to say nothing about Asian American LGBTQ+ superheroes. Do you feel any pressure leading that charge? I would say that I deal with that by bringing my own humanity and my own experiences into this character. Grace has gone through foster homes—I can relate to that because of personal experiences and having moved around a lot. I’ve had that experience in my life. As for the bisexuality, I’m an open-minded person and I can relate to different aspects of her in my own way. To represent it accurately is to represent it with as much humanity as I can. You’re also not entirely alone in bringing more superhero inclusivity to the screen. There seems to be a wave of new, diverse superheroes arriving on TV and on The CW in particular. Do you feel like you’re a part of something? Yeah, I feel like there’s definitely more representation, and I think it’s reflective of what America is in 2019. Also, the fanbase of comics in general is very diverse. I think it’s nice that superheroes are starting to reflect all kinds of people. I think there has been a big push towards visibility in the past few years. I feel like Anissa could maybe learn a few things from a comic book fan like Grace. What’s some advice that you, Chantal, would give Thunder if you could? I think right now Anissa is hyper-focused on the work. When we look at any comic book, the heroes are always fighting for something, usually either their family or love. So, there’s the fine line between being a superhero that’s a workaholic and balancing out your life. Every superhero needs a love, or a sidekick—a partner. She needs a partner! So, don’t forget that!